"Ethnicity" redirects here. For other uses, see Ethnicity (disambiguation). "Ethnicities" redirects here. It is not to be confused with the academic journal. 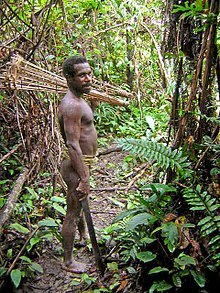 Papua were an uncontacted people. Their population numbers no more than 3,000. An ethnic group or an ethnicity, is a category of people who identify with each other based on similarities such as common ancestry, language, history, society, culture or nation. Ethnicity is usually an inherited status based on the society in which one lives. 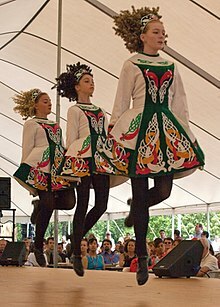 Membership of an ethnic group tends to be defined by a shared cultural heritage, ancestry, origin myth, history, homeland, language or dialect, symbolic systems such as religion, mythology and ritual, cuisine, dressing style, art or physical appearance. Ethnic groups, derived from the same historical founder population, often continue to speak related languages and share a similar gene pool. By way of language shift, acculturation, adoption and religious conversion, it is sometimes possible for individuals or groups to leave one ethnic group and become part of another (except for ethnic groups emphasizing homogeneity or racial purity as a key membership criterion). Ethnicity is often used synonymously with terms such as nation or people. In English, it can also have the connotation of something exotic (cf. "ethnic restaurant", etc. ), generally related to cultures of more recent immigrants, who arrived after the dominant population of an area was established. The largest ethnic groups in modern times comprise hundreds of millions of individuals ( Han Chinese being the largest), while the smallest are limited to a few dozen individuals (numerous indigenous peoples worldwide). Larger ethnic groups may be subdivided into smaller sub-groups known variously as tribes or clans, which over time may become separate ethnic groups themselves due to endogamy or physical isolation from the parent group. Conversely, formerly separate ethnicities can merge to form a pan-ethnicity and may eventually merge into one single ethnicity. Whether through division or amalgamation, the formation of a separate ethnic identity is referred to as ethnogenesis. The term ethnic is derived from the Greek word ἔθνος ethnos (more precisely, from the adjective ἐθνικός ethnikos,  which was loaned into Latin as ethnicus). The inherited English language term for this concept is folk, used alongside the latinate people since the late Middle English period. In the 19th century, the term came to be used in the sense of "peculiar to a race, people or nation", in a return to the original Greek meaning. The sense of "different cultural groups", and in American English "racial, cultural or national minority group" arises in the 1930s to 1940s,  serving as a replacement of the term race which had earlier taken this sense but was now becoming deprecated due to its association with ideological racism. The abstract ethnicity had been used for "paganism" in the 18th century, but now came to express the meaning of an "ethnic character" (first recorded 1953). The term ethnic group was first recorded in 1935 and entered the Oxford English Dictionary in 1972. Depending on the context that is used, the term nationality may either be used synonymously with ethnicity, or synonymously with citizenship (in a sovereign state). The process that results in the emergence of an ethnicity is called ethnogenesis, a term in use in ethnological literature since about 1950. In many cases – for instance, the sense of Jewish peoplehood – more than one aspect determines membership. According to Thomas Hylland Eriksen, the study of ethnicity was dominated by two distinct debates until recently. Another influential theoretician of ethnicity was Fredrik Barth, whose "Ethnic Groups and Boundaries" from 1969 has been described as instrumental in spreading the usage of the term in social studies in the 1980s and 1990s. Barth went further than Weber in stressing the constructed nature of ethnicity. To Barth, ethnicity was perpetually negotiated and renegotiated by both external ascription and internal self-identification. Barth's view is that ethnic groups are not discontinuous cultural isolates, or logical a prioris to which people naturally belong. He wanted to part with anthropological notions of cultures as bounded entities, and ethnicity as primordialist bonds, replacing it with a focus on the interface between groups. "Ethnic Groups and Boundaries", therefore, is a focus on the interconnectedness of ethnic identities. Barth writes: "... categorical ethnic distinctions do not depend on an absence of mobility, contact and information, but do entail social processes of exclusion and incorporation whereby discrete categories are maintained despite changing participation and membership in the course of individual life histories." Social scientists have thus focused on how, when, and why different markers of ethnic identity become salient. Thus, anthropologist Joan Vincent observed that ethnic boundaries often have a mercurial character. Ronald Cohen concluded that ethnicity is "a series of nesting dichotomizations of inclusiveness and exclusiveness". He agrees with Joan Vincent's observation that (in Cohen's paraphrase) "Ethnicity ... can be narrowed or broadened in boundary terms in relation to the specific needs of political mobilization. This may be why descent is sometimes a marker of ethnicity, and sometimes not: which diacritic of ethnicity is salient depends on whether people are scaling ethnic boundaries up or down, and whether they are scaling them up or down depends generally on the political situation. Examples of various approaches are: primordialism, essentialism, perennialism, constructivism, modernism and instrumentalism. "Primordialism", holds that ethnicity has existed at all times of human history and that modern ethnic groups have historical continuity into the far past. For them, the idea of ethnicity is closely linked to the idea of nations and is rooted in the pre-Weber understanding of humanity as being divided into primordially existing groups rooted by kinship and biological heritage. "Perpetual perennialism" holds that specific ethnic groups have existed continuously throughout history. "Situational perennialism" holds that nations and ethnic groups emerge, change and vanish through the course of history. This view holds that the concept of ethnicity is basically a tool used by political groups to manipulate resources such as wealth, power, territory or status in their particular groups' interests. Accordingly, ethnicity emerges when it is relevant as means of furthering emergent collective interests and changes according to political changes in the society. Examples of a perennialist interpretation of ethnicity are also found in Barth, and Seidner who see ethnicity as ever-changing boundaries between groups of people established through ongoing social negotiation and interaction. "Constructivism" sees both primordialist and perennialist views as basically flawed,  and rejects the notion of ethnicity as a basic human condition. It holds that ethnic groups are only products of human social interaction, maintained only in so far as they are maintained as valid social constructs in societies. "Modernist constructivism" correlates the emergence of ethnicity with the movement towards nation states beginning in the early modern period. Proponents of this theory, such as Eric Hobsbawm, argue that ethnicity and notions of ethnic pride, such as nationalism, are purely modern inventions, appearing only in the modern period of world history. They hold that prior to this, ethnic homogeneity was not considered an ideal or necessary factor in the forging of large-scale societies. Ethnicity theory says that race is a social category and is but one of several factors in determining ethnicity. Some other criteria include: "religion, language, 'customs,' nationality, and political identification". This theory was put forth by sociologist Robert E. Park in the 1920s. It is based on the notion of “culture”. Ethnicity theory was based on the assimilation model. Park outlined his four steps to assimilation: contact, conflict, accommodation, and assimilation. Instead of explaining the marginalized status of people of color in the United States with an inherent biological inferiority, he instead said that it was a failure to assimilate into American culture that held people back. They could be equal as long as they dropped their culture which was deficient compared to white culture. Michael Omi and Howard Winant's theory of racial formation directly confronts both ethnicity theory's premises and practices. They argue in Racial Formation in the United States that ethnicity theory was exclusively based on the immigration patterns of a white ethnic population and did not account for the unique experiences of non-whites in this country. While this theory identities different stages in an immigration process – contact, conflict, struggle, and as the last and best response, assimilation – it did so only for white ethnic communities. The ethnicity paradigm neglects the ways that race can complicate a community's interactions with basic social and political structures, especially upon contact. In some cases, especially involving transnational migration, or colonial expansion, ethnicity is linked to nationality. Anthropologists and historians, following the modernist understanding of ethnicity as proposed by Ernest Gellner  and Benedict Anderson  see nations and nationalism as developing with the rise of the modern state system in the 17th century. They culminated in the rise of "nation-states" in which the presumptive boundaries of the nation coincided (or ideally coincided) with state boundaries. Thus, in the West, the notion of ethnicity, like race and nation, developed in the context of European colonial expansion, when mercantilism and capitalism were promoting global movements of populations at the same time that state boundaries were being more clearly and rigidly defined. In the 19th century, modern states generally sought legitimacy through their claim to represent "nations." Nation-states, however, invariably include populations that have been excluded from national life for one reason or another. Members of excluded groups, consequently, will either demand inclusion on the basis of equality, or seek autonomy, sometimes even to the extent of complete political separation in their own nation-state. Under these conditions – when people moved from one state to another,  or one state conquered or colonized peoples beyond its national boundaries – ethnic groups were formed by people who identified with one nation, but lived in another state. Multi-ethnic states can be the result of two opposite events, either the recent creation of state borders at variance with traditional tribal territories, or the recent immigration of ethnic minorities into a former nation state. Examples for the first case are found throughout Africa, where countries created during decolonisation inherited arbitrary colonial borders, but also in European countries such as Belgium or United Kingdom. Examples for the second case are countries such as Germany or the Netherlands, which were relatively ethnically homogeneous when they attained statehood but have received significant immigration during the second half of the 20th century. States such as the United Kingdom, France and Switzerland comprised distinct ethnic groups from their formation and have likewise experienced substantial immigration, resulting in what has been termed " multicultural" societies especially in large cities. The states of the New World were multi-ethnic from the onset, as they were formed as colonies imposed on existing indigenous populations. In recent decades feminist scholars (most notably Nira Yuval-Davis)  have drawn attention to the fundamental ways in which women participate in the creation and reproduction of ethnic and national categories. Though these categories are usually discussed as belonging to the public, political sphere, they are upheld within the private, family sphere to a great extent. It is here that women act not just as biological reproducers but also as 'cultural carriers', transmitting knowledge and enforcing behaviours that belong to a specific collectivity. Women also often play a significant symbolic role in conceptions of nation or ethnicity, for example in the notion that 'women and children' constitute the kernel of a nation which must be defended in times of conflict, or in iconic figures such as Britannia or Marianne. Before Weber (1864-1920), race and ethnicity were primarily seen as two aspects of the same thing. Around 1900 and before, the essentialist primordialist understanding of ethnicity predominated: cultural differences between peoples were seen as being the result of inherited traits and tendencies. With Weber's introduction of the idea of ethnicity as a social construct, race and ethnicity became more divided from each other. Sometimes ethnic groups are subject to prejudicial attitudes and actions by the state or its constituents. In the 20th century, people began to argue that conflicts among ethnic groups or between members of an ethnic group and the state can and should be resolved in one of two ways. Some, like Jürgen Habermas and Bruce Barry, have argued that the legitimacy of modern states must be based on a notion of political rights of autonomous individual subjects. According to this view, the state should not acknowledge ethnic, national or racial identity but rather instead enforce political and legal equality of all individuals. Others, like Charles Taylor and Will Kymlicka, argue that the notion of the autonomous individual is itself a cultural construct. According to this view, states must recognize ethnic identity and develop processes through which the particular needs of ethnic groups can be accommodated within the boundaries of the nation-state. The 19th century saw the development of the political ideology of ethnic nationalism, when the concept of race was tied to nationalism, first by German theorists including Johann Gottfried von Herder. Instances of societies focusing on ethnic ties, arguably to the exclusion of history or historical context, have resulted in the justification of nationalist goals. Two periods frequently cited as examples of this are the 19th century consolidation and expansion of the German Empire and the 20th century Nazi Germany. Each promoted the pan-ethnic idea that these governments were only acquiring lands that had always been inhabited by ethnic Germans. The history of late-comers to the nation-state model, such as those arising in the Near East and south-eastern Europe out of the dissolution of the Ottoman and Austro-Hungarian Empires, as well as those arising out of the former USSR, is marked by inter-ethnic conflicts. Such conflicts usually occur within multi-ethnic states, as opposed to between them, as in other regions of the world. Thus, the conflicts are often misleadingly labelled and characterized as civil wars when they are inter-ethnic conflicts in a multi-ethnic state. Ethnic groups in Africa number in the hundreds, each generally having its own language (or dialect of a language) and culture. The Assyrians are the indigenous peoples of Northern Iraq. There is an abundance of ethnic groups throughout Asia, with adaptations to the climate zones of Asia, which can be Arctic, subarctic, temperate, subtropical or tropical. The ethnic groups have adapted to mountains, deserts, grasslands, and forests. On the coasts of Asia, the ethnic groups have adopted various methods of harvest and transport. Some groups are primarily hunter-gatherers, some practice transhumance (nomadic lifestyle), others have been agrarian/rural for millennia and others becoming industrial/urban. Some groups/countries of Asia are completely urban (Hong Kong, Shanghai and Singapore). The colonization of Asia was largely ended in the 20th century, with national drives for independence and self-determination across the continent. 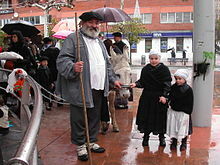 The Basque people constitute an indigenous ethnic minority in both France and Spain. A number of European countries, including France,  and Switzerland do not collect information on the ethnicity of their resident population. Russia has over 185 recognized ethnic groups besides the 80% ethnic Russian majority. The largest group are the Tatars 3.8%. Many of the smaller groups are found in the Asian part of Russia (see Indigenous peoples of Siberia). An example of a largely nomadic ethnic group in Europe is the Roma, pejoratively known as Gypsies. They originated from India and speak the Romani language. ^ "ethnicity: definition of ethnicity". Oxford Dictionaries. Oxford University Press. Retrieved 28 December 2013. ^ People, James; Bailey, Garrick (2010). Humanity: An Introduction to Cultural Anthropology (9th ed.). Wadsworth Cengage learning. p. 389. In essence, an ethnic group is a named social category of people based on perceptions of shared social experience or one's ancestors' experiences. 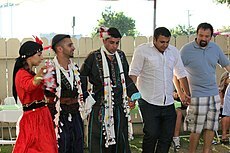 Members of the ethnic group see themselves as sharing cultural traditions and history that distinguish them from other groups. Ethnic group identity has a strong psychological or emotional component that divides the people of the world into opposing categories of “us” and “them.” In contrast to social stratification, which divides and unifies people along a series of horizontal axes on the basis of socioeconomic factors, ethnic identities divide and unify people along a series of vertical axes. Thus, ethnic groups, at least theoretically, cut across socioeconomic class differences, drawing members from all strata of the population. 2.a. Pertaining to race; peculiar to a race or nation; ethnological. Also, pertaining to or having common racial, cultural, religious, or linguistic characteristics, esp. designating a racial or other group within a larger system; hence (U.S. colloq. ), foreign, exotic. b ethnic minority (group), a group of people differentiated from the rest of the community by racial origins or cultural background, and usu. claiming or enjoying official recognition of their group identity. Also attrib. ^ I. Polinskaya, "Shared sanctuaries and the gods of others: On the meaning Of 'common' in Herodotus 8.144", in: R. Rosen & I. Sluiter (eds. ), Valuing others in Classical Antiquity (LEiden: Brill, 2010), 43-70. ^ Herodotus, 8.144.2: "The kinship of all Greeks in blood and speech, and the shrines of gods and the sacrifices that we have in common, and the likeness of our way of life." ^ Geertz, Clifford, ed. (1967) Old Societies and New States: The Quest for Modernity in Africa and Asia. New York: The Free Press. ^ Cohen, Abner (1969) Custom and Politics in Urban Africa: A Study of Hausa Migrants in a Yoruba Town. London: Routledge & Kegan Paul. ^ Abner Cohen (1974) Two-Dimensional Man: An essay on power and symbolism in complex society. London: Routledge & Kegan Paul. ^ Gellner, Ernest (1983) Nations and Nationalism. Oxford: Blackwell. ^ Ernest Gellner (1997) Nationalism. London: Weidenfeld & Nicolson. ^ Smith, Anthony D. (1986) The Ethnic Origins of Nations. Oxford: Blackwell. ^ Anthony Smith (1991) National Identity. Harmondsworth: Penguin. ^ Banton, Michael. (2007) "Weber on Ethnic Communities: A critique", Nations and Nationalism 13 (1), 2007, 19–35. ^ James, Paul (2015). "Despite the Terrors of Typologies: The Importance of Understanding Categories of Difference and Identity". Interventions: International Journal of Postcolonial Studies. 17 (2): 174–195. ^ a b Noel, Donald L. (1968). "A Theory of the Origin of Ethnic Stratification". Social Problems. 16 (2): 157–172. doi: 10.1525/sp.1968.16.2.03a00030. ^ a b c Bobo, Lawrence; Hutchings, Vincent L. (1996). "Perceptions of Racial Group Competition: Extending Blumer's Theory of Group Position to a Multiracial Social Context". American Sociological Review. American Sociological Association. 61 (6): 951–972. doi: 10.2307/2096302. JSTOR 2096302. ^ Hobsbawm and Ranger (1983), The Invention of Tradition, Sider 1993 Lumbee Indian Histories. ^ Camoroff, John L. and Jean Camoroff 2009: Ethnicity Inc.. Chicago: Chicago Press. ^ O'Neil, Dennis. "Nature of Ethnicity". Palomar College. Retrieved 7 January 2013. ^ Walter Pohl, "Conceptions of Ethnicity in Early Medieval Studies", Debating the Middle Ages: Issues and Readings, ed. Lester K. Little and Barbara H. Rosenwein, (Blackwell), 1998, pp 13–24, notes that historians have projected the 19th-century conceptions of the nation-state backwards in time, employing biological metaphors of birth and growth: "that the peoples in the Migration Period had little to do with those heroic (or sometimes brutish) clichés is now generally accepted among historians," he remarked. Early medieval peoples were far less homogeneous than often thought, and Pohl follows Reinhard Wenskus, Stammesbildung und Verfassung. (Cologne and Graz) 1961, whose researches into the "ethnogenesis" of the German peoples convinced him that the idea of common origin, as expressed by Isidore of Seville Gens est multitudo ab uno principio orta ("a people is a multitude stemming from one origin") which continues in the original Etymologiae IX.2.i) "sive ab alia natione secundum propriam collectionem distincta ("or distinguished from another people by its proper ties") was a myth. ^ Grosfoguel, Ramán (September 2004). "Race and Ethnicity or Racialized Ethnicities? Identities within Global Coloniality". Ethnicities. 315-336. 4 (3): 315. doi: 10.1177/1468796804045237. Retrieved 2012-08-06. ^ Wallman, S. "Ethnicity research in Britain", Current Anthropology, v. 18, n. 3, 1977, pp. 531–532. ^ "A Brief History of the OMB Directive 15". American Anthropological Association. 1997. Retrieved 2007-05-18. ^ Cohen, Robin (1995). The Cambridge Survey of World Migration. Cambridge University Press. p. 197. ISBN 0-521-44405-5. Wickens, Gerald E; Lowe, Pat (2008). The Baobabs: Pachycauls of Africa, Madagascar and Australia. Springer Science+Business Media. 2008. p. 360. ISBN 978-1-4020-6431-9. ^ "The Scottish Diaspora and Diaspora Strategy: Insights and Lessons from Ireland". www2.gov.scot. 29 May 2009. ^ Christoph Pan, Beate Sibylle Pfeil,Minderheitenrechte in Europa. Handbuch der europäischen Volksgruppen (2002)., English translation 2004. ^ (in French) article 8 de la loi Informatique et libertés, 1978: "Il est interdit de collecter ou de traiter des données à caractère personnel qui font apparaître, directement ou indirectement, les origines raciales ou ethniques, les opinions politiques, philosophiques ou religieuses ou l'appartenance syndicale des personnes, ou qui sont relatives à la santé ou à la vie sexuelle de celles-ci." Beard, David and Kenneth Gloag. 2005. Musicology, The Key Concepts. London and New York: Routledge. Billinger, Michael S. (2007), "Another Look at Ethnicity as a Biological Concept: Moving Anthropology Beyond the Race Concept", Critique of Anthropology 27,1:5–35. Hartmann, Douglas. "Notes on Midnight Basketball and the Cultural Politics of Recreation, Race and At-Risk Urban Youth", Journal of Sport and Social Issues. 25 (2001): 339-366. Hasmath, R. ed. 2011. Managing Ethnic Diversity: Meanings and Practices from an International Perspective. Burlington, VT and Surrey, UK: Ashgate. Hobsbawm, Eric, and Terence Ranger, editors, The Invention of Tradition. (Cambridge: Cambridge University Press, 1983). Hutcheon, Linda (1998). "Crypto-Ethnicity" (PDF). PMLA: Publications of the Modern Language Association of America. 113 (1): 28–51. Levinson, David, Ethnic Groups Worldwide: A Ready Reference Handbook, Greenwood Publishing Group (1998), ISBN 978-1-57356-019-1. Merriam, A.P. 1959. "African Music", in R. Bascom and, M.J. Herskovits (eds), Continuity and Change in African Cultures, Chicago, University of Chicago Press. Morales-Díaz, Enrique; Gabriel Aquino; & Michael Sletcher, "Ethnicity", in Michael Sletcher, ed., New England, (Westport, CT, 2004). Omi, Michael; Winant, Howard (1986). Racial Formation in the United States from the 1960s to the 1980s. New York: Routledge and Kegan Paul, Inc.
Seeger, A. 1987. Why Suyá Sing: A Musical Anthropology of an Amazonian People, Cambridge, Cambridge University Press. Seidner, Stanley S. Ethnicity, Language, and Power from a Psycholinguistic Perspective. (Bruxelles: Centre de recherche sur le pluralinguisme1982). Sider, Gerald, Lumbee Indian Histories (Cambridge: Cambridge University Press, 1993). Smith, Anthony D. (1987). "The Ethnic Origins of Nations". Blackwell. Smith, Anthony D. (1998). Nationalism and modernism. A Critical Survey of Recent Theories of Nations and Nationalism. London; New York: Routledge. Smith, Anthony D. (1999). "Myths and memories of the Nation". Oxford University Press. ^ U.S. Census Bureau State & County QuickFacts: Race. Look up ethnicity, ethnic, nationality, or nation in Wiktionary, the free dictionary. 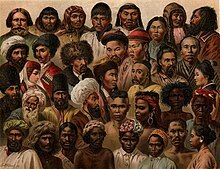 Wikimedia Commons has media related to Ethnic groups.